Indian bystanders watch the live telecast of the launch of India's Mars Orbiter Mission inside a showroom in New Delhi on November 5, 2013. India's first mission to Mars blasted off as the country aims to become the only Asian nation to reach the Red Planet with a programme showcasing its low-cost space technology. India made history twice last week with its Mars orbiter, Mangalyaan. First, the Indian Space Research Organisation's spacecraft arrived safely in Mars' orbit on Wednesday, making India the first nation to reach the red planet's orbit on their first try. 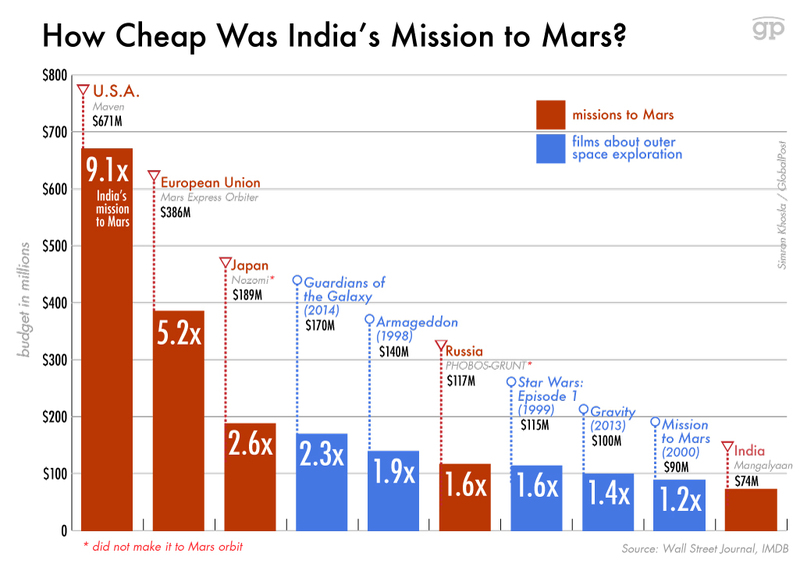 Then — and this might be even more impressive — India set the record for the cheapest-ever mission to Mars. It cost a total of $74 million, only 11 percent of the bill for NASA's most recent Mars mission. The chart below shows just how cheap we're talking.